After Milan, my next stop was the beautiful city of Vienna! Laya, a former coworker of mine at SFU, met me at Landstraße station and helped me find my way to my hostel. I freshened up and met up with Laya, who showed me around. We had dinner in Stephansplatz and walked around the Hofburg Palace area, which was packed for Vienna’s Pride celebrations. Next, we walked over to MuseumsQuartier, which was definitely my favourite place in Vienna and I visited it pretty much every day I was in the city. Soon, it was nightfall and as Laya said that Vienna is pretty happening on Saturday evenings, we went over to Schwedenplatz and hung out around the Donaukanal. For breakfast, Laya took me to this super fancy place called Demel. Of course, all I could do was look at the amazing pastries and smell them thanks to my egg allergy. We then went to do some exploring at Schönbrunn Palace. The palace and its grounds cover a huge amount of space and we didn’t even get to visit everything. We toured the inside of the palace and after getting some grub at the café, Laya and I walked up the hill in the blistering heat to the Gloriette. Everything about Schönbrunn Palace is spectacular and a must-see for those visiting Vienna. As the weekend was no more, Laya had to work, which meant I got to explore Vienna solo style. 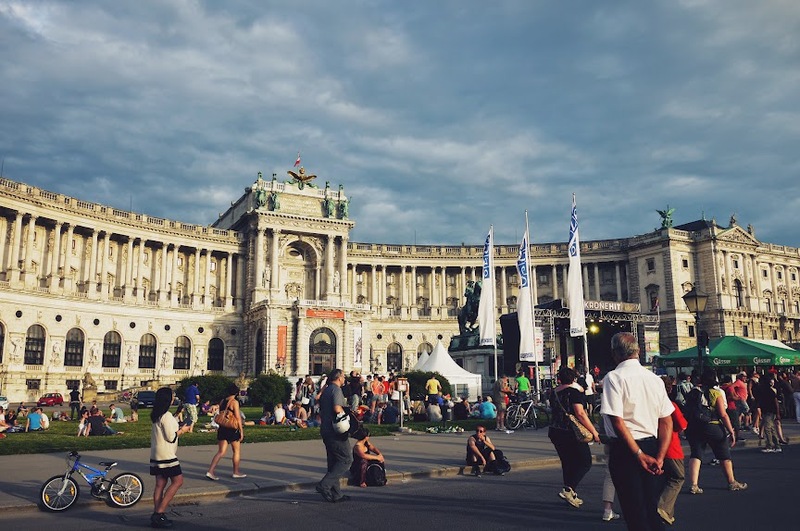 My first stop was the Belvedere Palace to check out the art collection and Gustav Klimt’s “The Kiss.” Next, I went to check out more art at the mumok, Vienna’s museum of modern art. I wish I had gotten the chance to visit the mumok when the Dan Flavin exhibition was there because I heard such great things about it, but one Flavin work was good enough for me. I decided to keep things chill on my last day in Vienna, mostly because of the heat and also because I had done pretty much everything on my list. I went for frozen yogurt in MuseumsQuartier again and used the photobooth there. And afterwards, I walked around the Hofburg Palace and browsed some shops in Stephansplatz. Since it was my final night, Laya and I met up for dinner at yamm!, this cool vegetarian and vegan place near the university. The decor is really neat and they weigh your food to determine how much you need to pay for it. Next up: one of my favourite cities, Berlin!